My name is Cari Wilson and I teach two classes of Grade 7 in West Vancouver. I am very fortunate to teach in a one-to-one laptop setting and have done so for the last 4 years. I teach LA, SS French and Visual Art and we use the laptops for all of them! I am taking my last two MET courses this term – this one and 590. I’ve never take two at the same time before, so I’m a little nervous about fitting everything in! I recently made the very challenging decision not to go into administration. Instead, I’m going to focus on doing Pro-D workshops and maybe some consulting. So, I’m really looking forward to learning some more about business and elearning! I must admit that I’m not totally sure what to expect! 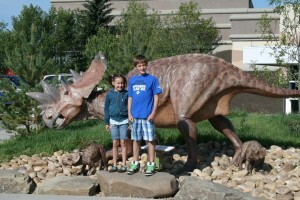 The photo is a picture of my two kids in front of the “dinosaur museum” in Drumheller, Alberta. The kids and I went on a three week road trip this summer and the museum was one of our favourite stops. We also loved Yellowstone Park and Lake Superior. I took all the pictures, so I have no photos of me. I’m looking forward to meeting all of you!